It’s love at first stay - prepare to fall for the incredible JH Villa. 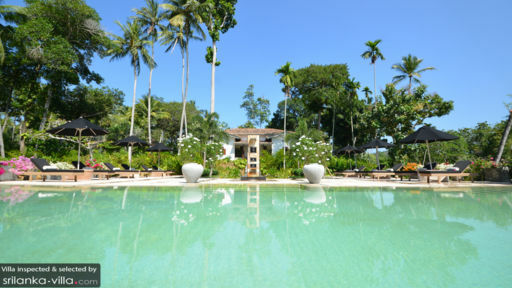 A former Portuguese colonial estate, the villa occupies a stunning hilltop location with views out to the Indian Ocean. Containing generously proportioned living spaces and suites, a sprawling garden and a full range of modern amenities, JH Villa is ideally kitted out for groups of 12. As a full-service property, guests will enjoy impeccable 24/7 service throughout their stay. 12 guests are comfortably accommodated in six bedrooms. Grand and impeccably furnished, it is fitting that each suite is named after a gemstone. Both the Ruby and Emerald suites are outfitted with a four poster canopy bed and sun-soaked verandah. Each suite sleeps two guests. The Amethyst suite features a verandah, side patio and two single beds (it can be converted into a king bed at your request). The suite accommodates two guests. The Topaz Suite comes fitted with a king bed, walk-in closet, en suite bathroom, living area with kitchen and built-in dining table and a verandah. The suite sleeps two guests. Both the Jade and Sapphire suites sleep three guests. Each suite features a four poster canopy bed, a convertible sofa bed and a capacious verandah. 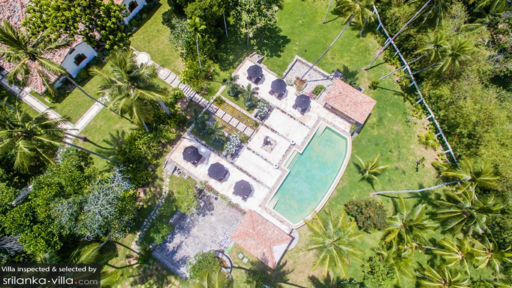 Spread out across three acres, the garden at JH Villa is a lush oasis; the grounds are immaculately maintained, abundant with tropical foliage and stretch out towards the sands of a coral beach (it’s just a 5-minute stroll away from the villa). The focal point here is a sparkling 15-metre infinity pool flanked by sun umbrellas, recliners and pavilions; with views out to an emerald landscape and striking sunsets, it’s unsurprising that this stands out as a favourite among guests at JH Villa. An open-air pavilion serves as the perfect venue for meditation, yoga or a candle-lit al fresco dinner. Guests will also enjoy access to a private beach house. Perched alongside the coast, the beach house features a spacious sitting area, verandah overlooking the Indian OCean, kitchen, bathroom, outdoor shower and lawn. JH Villa’s wonderfully appointed living spaces ooze an air of grandeur; the beautifully carved pillars, intricate wooden fixtures and elegant furnishings reveal that much attention has been paid to the details in the process of decorating the home. The lofty, vaulted ceilings add on to the sense of spaciousness within, and large windows allow sunlight to cascade in, creating interiors that are bright and airy. You’ll enjoy cooking up a storm in an air-conditioned kitchen equipped with state of the art appliances, like a double fridge, freezer, wine cooler, professional oven, 6-burner cooker and more - or leave the cooking to your in-villa chef. A fully equipped laundry room serves the needs of all guests. As expected of a luxury property, JH Villa offers a full range of services and amenities - so you’ll never be left wanting for more throughout your stay. A villa manager offers ready assistance to your vacation needs, and you’ll also enjoy the services of an in-villa chef, housekeeping team and security staff. Other services included with your stay are: daily breakfasts, welcome drink upon arrival and access to beach house. A cot and high chair will be provided at request. Services available at additional cost include: airport transfers, daily transportation, laundry services, set menu for lunch or dinner and an à la carte all-day dining menu. Do note that dishes not listed in the menu may be prepared at your request, subject to the availability of ingredients. 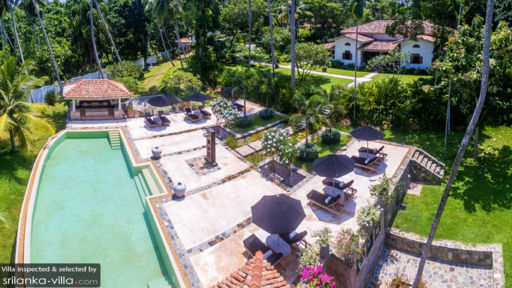 Located just 15 minutes’ drive from Galle, JH Villa puts vacationers within easy reach to a variety of local attractions and amenities. Churches. You’ll also enjoy exploring its myriad restaurants, cafes, boutiques and galleries. About 10 minutes’ drive away lies the coastal town of Unawatuna. Its crescent-shaped beach is popular with vacationers; there’s plenty of seafood feasting, along with excellent swimming, scuba diving and snorkelling to be enjoyed. While there are numerous tea plantations across the island, Handunugoda Tea Estate is one that stands out with its comprehensive tea tasting sessions and well-guided tours. It’s located about 25 minutes’ drive from your villa. Other well-sought-after activities in the region include turtle hatchery visits and whale watching tours. The Sea Turtle Farm & Hatchery at Habaraduwa (three minutes’ drive) and Mirissa Harbour (40 minutes’ drive) are venues where you can participate in these activities.